Digital transformation has pioneered an ever-evolving landscape in the omnichannel retail experience. To efficiently meet consumer demands, retailers consider a fully immersive omnichannel customer experience as integral to their engagement strategy. With increasingly varied technologies such as NFC-based payments, digital signage with rich-media experiences, wireless technologies and IoT technologies—present great opportunities and complexities. New technologies are often being rolled out without a centrally managed approach leading to siloed solution landscape, making deployment difficult. 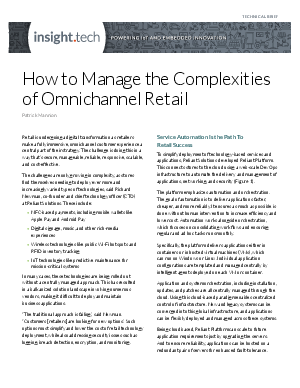 Uncover the path to simplify and automate, where the Reliant Platform delivered performance, scalability, reliability, security, and inter-operability Reliant needs for retail applications.